Since 2009, the US dollar has been the currency of Zimbabwe. Inflation is such that at one point, in order to keep up with it, they issued a $100,000,000,000,000 Zimbabwean dollar bill. This is no joke or exaggeration and an ugly scenario for a poor country. Zimbabweans also accept South African rand and Botswana pulas, but the US dollar is the official currency. 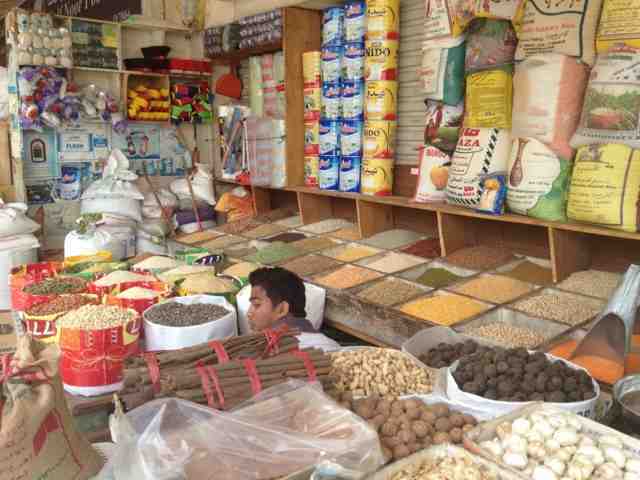 However, they don't have a lot of "things" so there is a very strong barter system in place. 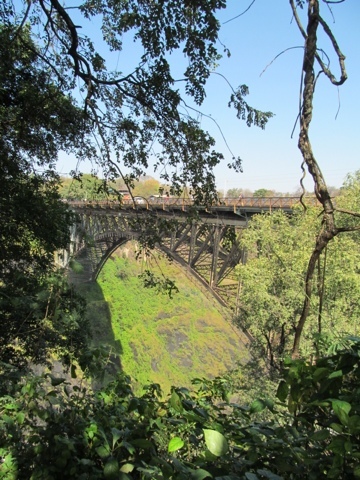 In the tourist center of Victoria Falls, there are craft markets where you can trade your used clothes or leftover food for crafts. And in every store or market, official or street, they don't have any loose change. If you want to buy something that's less than a dollar, they give you two of those somethings, or throw in a keychain.If you buy something in a store, change is given in trinkets. If your bill comes out to $7.35 and you hand the cashier 8 US dollars, you may get back 2 pula and a lollipop. Of course, prices are mostly presented in whole dollars. And in tourist centers, things are not cheap. 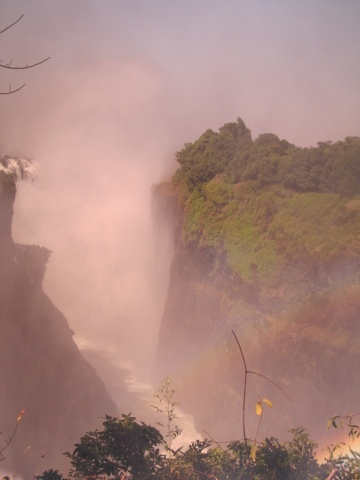 It cost 35$ to go to Victoria Falls. And it was worth every penny, rand, and pula we spent. Without the lollipop. Namibia faded in the distance as we crossed the border into Botswana. This really was the part of the trip I was most looking forward to. It was everything I thought it would be, and so so much more. 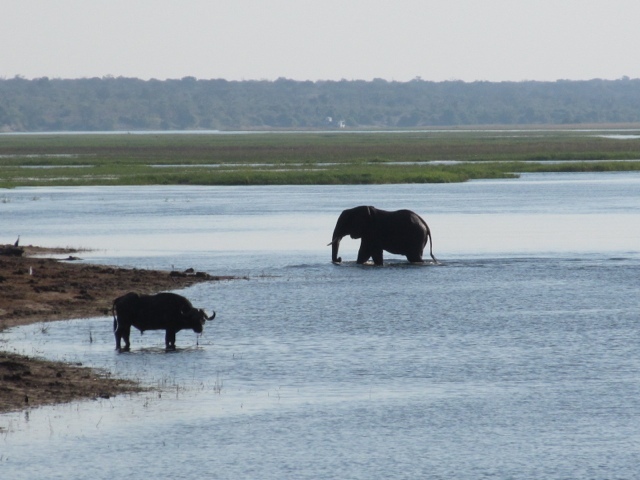 Our first adventure in this marvelous country was a scenic flight over the Okavango delta, the largest inland delta in the world. Africa seems to own the saying. "largest in the world". Since we were in small planes, we separated into three groups at the airport. Forty five minutes were spent soaring over grassland and streams and ponds full of hippos and egrets and more elephants than I've ever seen in my life! It seemed so unnatural for being so...natural. Many people fly in to the delta to stay for a few days. On a budget trip, we would be taking a four wheel vehicle and a boat. Love this sense of humor! I upgraded to a rustic cabin that night. It was expensive but worth it. We arose quite early the following morning, and piled into a land vehicle and went forward, first on a regular highway, and then onto a bumpy dirt road. An hour later we arrived at a landing beside a river, where several women with mokoros were waiting. A mokoro is like a canoe. Traditionally, they are made out of a piece of wood, much like a pirogue in south Louisiana. But tourism and general advancement, I presume, has paved the way for fiberglass ones. 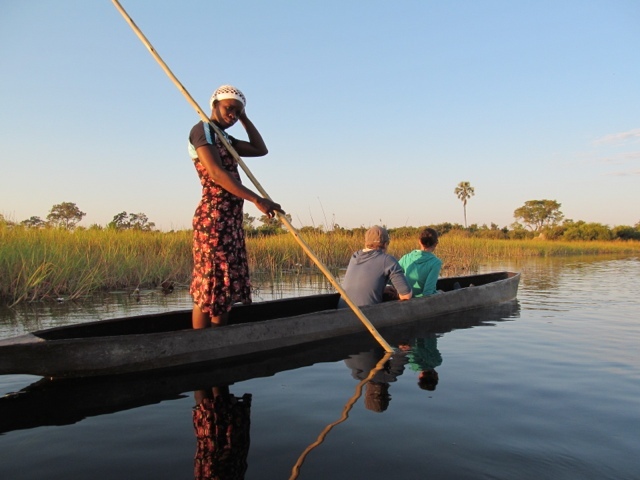 Each mokoro fit two travelers, various camping equipment, and one African woman steering the boat with a long pole. These women are called polers. I love Africa. They don't mince words. For the next two hours, we glided up the river, trying not to tip our boats, and relaxed. It was beautiful. Tall grasses lined either side of the river, water lilies were in bloom, and the temperature hovered around 70 degrees. The polers stood at the back of the boat, using their poles to make sure we didn't tip or get stuck. Later, some of our group would try poling, and it proved much more difficult than imagined. One boat even needed to be rescued! We spent two nights camping in the bush with our polers. 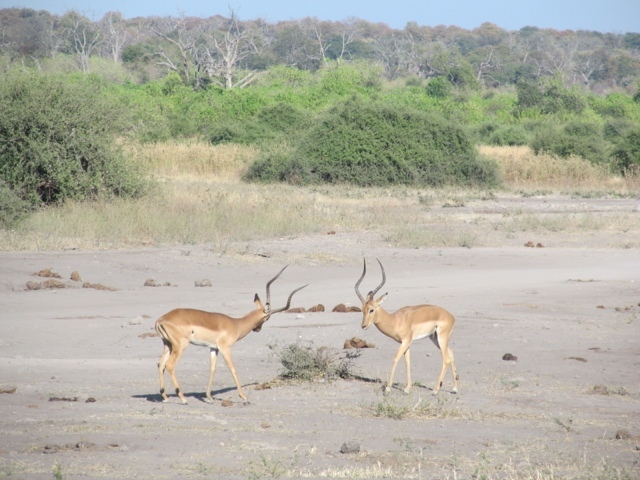 Our Okavango guide took us on a walk through the delta, where we were in stones throwing distance to herds of elephants, zebras, and wildebeest. We saw a few giraffes, too. It was pretty intense being so close to the elephants. Close enough for them to lock eyes, which they did. It was hard NOT to be scared that the animals would come into our camp, especially after the guide told us to make sure we shine a light before we go out to pee pee in the bush. If we see a reflection, go back to your tent. As far as I know, we didn't get any visitors. It was a lovely 2 day trip relaxing by the river. And at about hour 36, all I could think about was planning when I would take a hot shower. We were all absolutely filthy. THe 8 year old playing in the mud kind of filthy. It was really fun. That night, we stayed in a campsite called Planet Boabab. The Baobab tree is a gigantic tree that looks as if it's roots are on the outside. The trunk is thicker than any redwood I've ever seen, and holds water in the dry lowveld. For lack of any other words to describe it, it's a really unique and funny looking tree. The campsite was built around several of them, using them as focal points. There was a beautiful thatch roof bar and bonfire here, as well as artistic bathrooms, a beautiful swimming pool, and super pricey bungalows for those not camping. 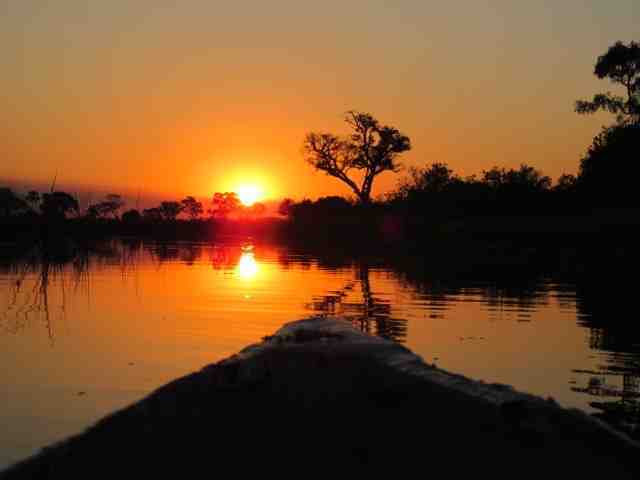 The location is set perfectly between the Okavango delta and Chobe national park, our next destination. We arrived at our Chobe campsite in time to do laundry, take a swim, and buy drinks for our "boozie cruise" as Hofti called it. 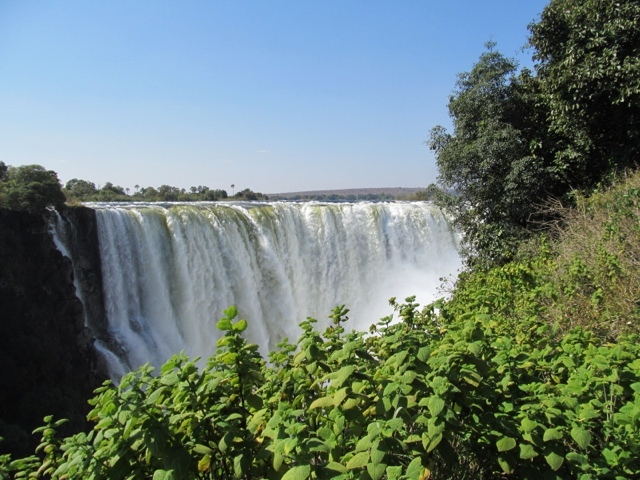 It really was a basic cruise up the Chobe river (which turns into the Zambezi across the nearby Zimbabwean border, and into Victoria Falls). The cruise was magnificent!!! We saw the greatest assortment of animals! Buffalo hanging out next to elephants, crocodiles and kudu basking in the sun while baboons ran in front of them. 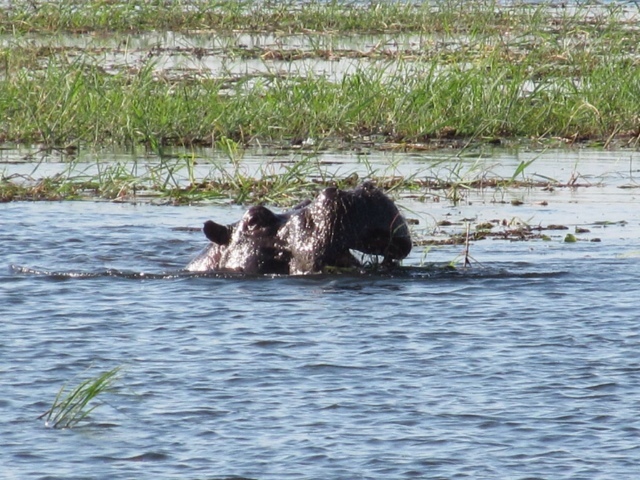 And hippos!!! So many hippos! Everywhere we turned, there were animals enjoying the water nearby. It was magical. This was our last night camping, and though we were all happy to be going to a hotel the following night, this also meant the end of the trip and goodbyes. 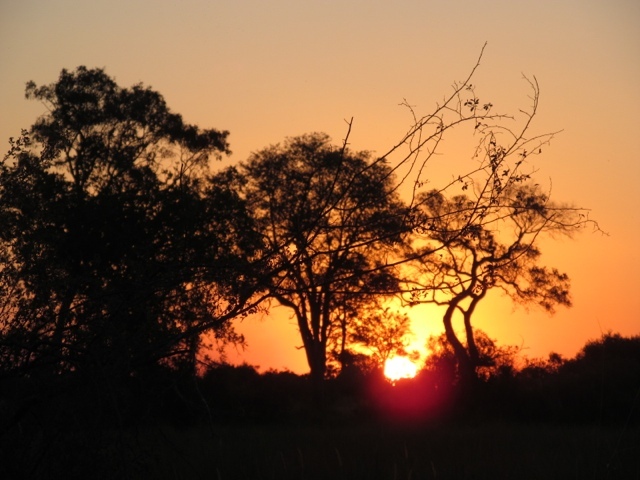 We stayed up late, but arose early again, for one last game drive in Chobe National Park. We bundled up in winter clothes and blankets and hopped on the safari truck before sunrise. 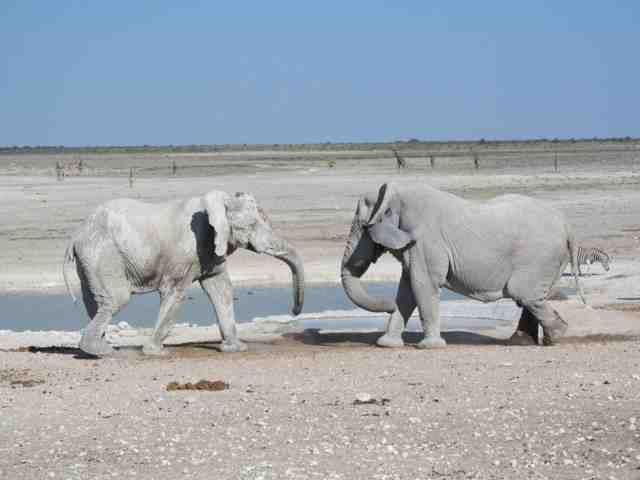 Once inside the park, it became clear we were not the only truck in the park, unlike Etosha. We were also not the only group in our safari vehicle. There was a group of French tourists with an interpreter, and they were not following directions. The stood and almost fell when our driver went four wheel driving into the sand, and they would not stop talking and didn't understand why the animals we spotted kept running way. My teacher self got the better of me and I shooshed them, but it only lasted a moment. It was on this truck, in the presence of about 6 more, that I witnessed what I consider to be my nature highlight of this trip, this year, and perhaps this lifetime. 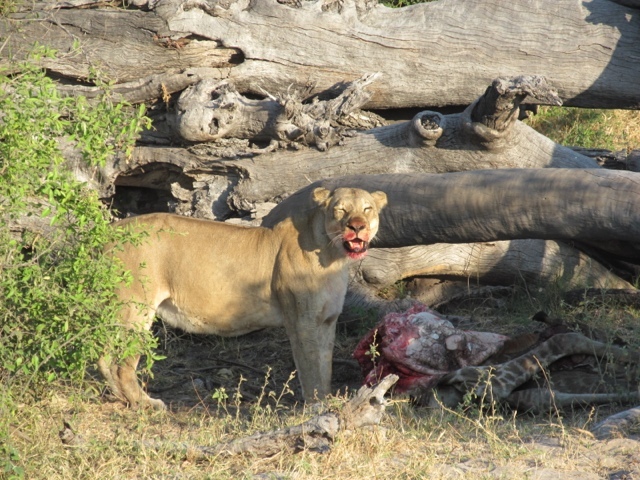 The sun had just risen, and a beautiful lioness was crouching beside a fallen dead tree limb. Almost as if waiting for a signal from our driver, she ducked her head under the limb, and dragged out her cache from the night before. Once in plain site, it was obvious that it was the lower half of a giraffe. She placed it on the ground, and looked what seemed to be directly at us, fresh blood on her snout, and smiled. She stayed this way, breathing so heavily, her chest and legs were moving, for a few moments, before she leaned down, attached her jaw to the carcass, and dragged it further underneath another branch, while three or four baby cubs scampered up the hill behind her. This all happened in a matter of minutes, about thirty feet from where we were. We may have been able to hear her breathe if it weren't for the multiple camera snaps and such (really, can't people put those on silent?! ), and some muffled gasps. AMAZING!!!! 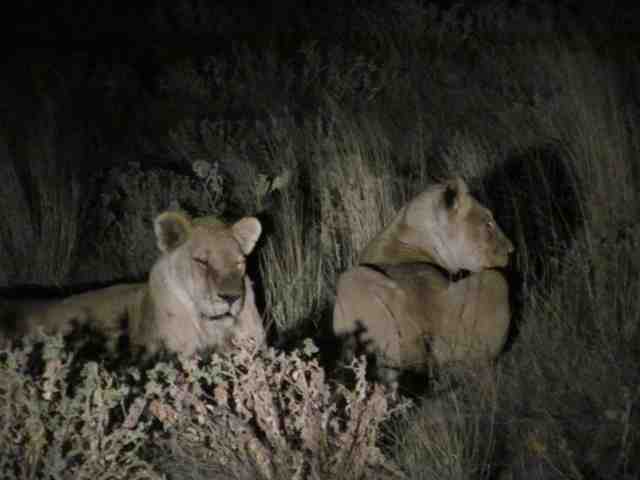 We moved on after a few minutes of trying to find her cubs, and started heading slowly back towards camp. We were at the point in our animal spotting that we caught ourselves saying, "oh, it's just another zebra." We had to remember our companions maybe didn't feel this way, so we still stopped at every animal we saw, including two impalas ready to spar. Time got away from us, and we really did need to just drive forward and get back to camp. 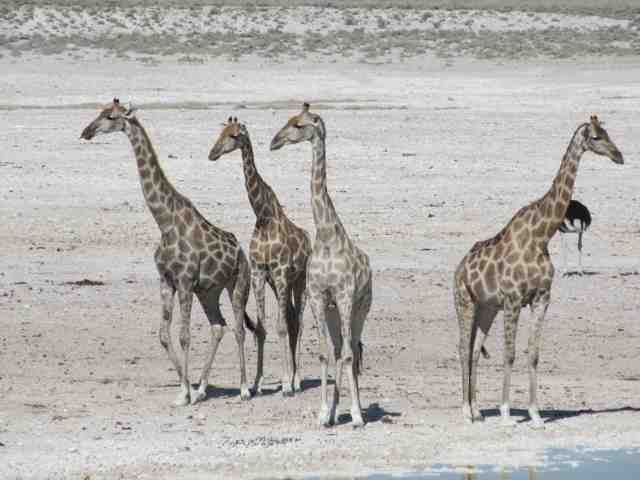 About five minutes into our drive, we heard from our French companions, a resounding, "GIRAFFE!!!!! STOP!!!!!!" Of course we stopped. And of course, the giraffe didn't stick around for a photo opportunity. They were disappointed. We were busting a gut, trying to figure out what they weren't understanding about screaming. This was fodder for the final 12 hours we spent together. We got back to camp at around 9:00 with a breakfast spread of everything leftover on the table, and our tents put away for us. This was really happening. We were on our last day of the trip. 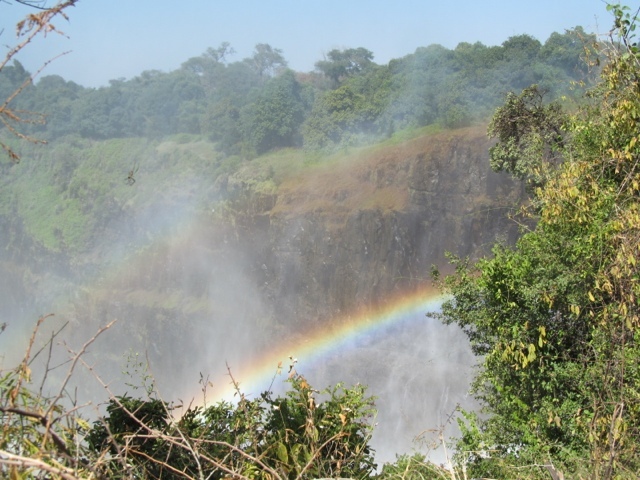 We climbed into the truck, and began the short journey to Zimbabwe. I never thought about where this saying came from, but I've definitely heard it when referring to favorite bars. I just spent a sunset and evening at a water hole, though it was outside, and unlike a bar, the people completely silent. 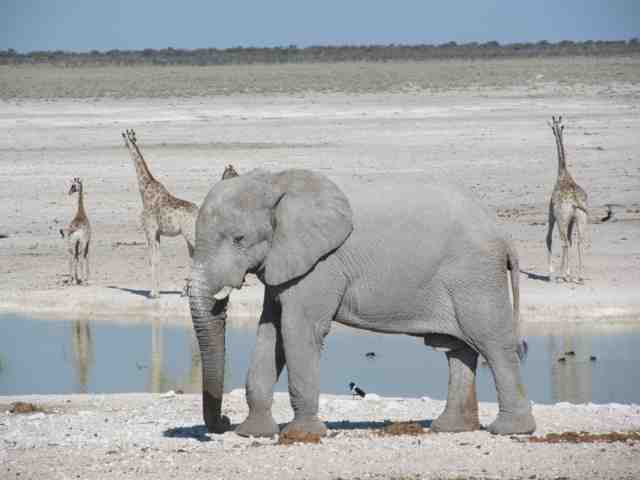 Every campsite in Etosha national park has a watering hole. Africa may be the only place I've ever been where the hierarchy actually makes sense. The entire campsite is behind a rock and fence wall, and the animals are free. Though some of the water holes are equipped with man made pumps, make no mistake, this is not a zoo. Not a show, no animals have been trained and that means we are living in their domain. We are the ones in cages. And it's fabulous. 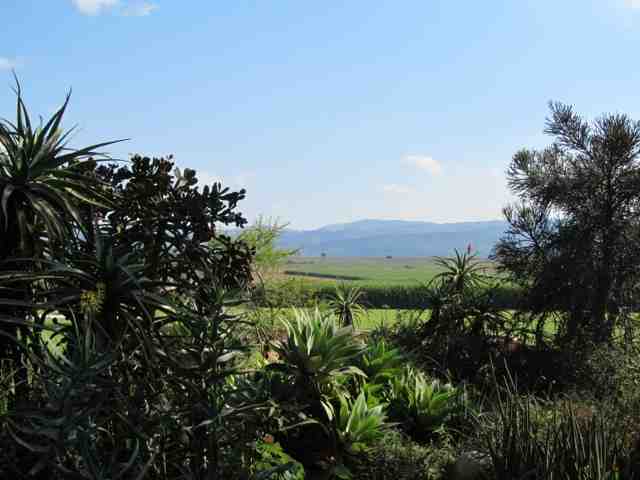 The campsites are quite nice, most having several types of bungalow accommodation also. Hot showers, drinkable water. The rules are strict. No driving between the hours of 6pm and 6am, unless you are in a licensed game drive vehicle (land rover), of which they only allow two each evening. The camp is gated, and there is a tall sharp rock fence separating the water hole from the viewing area. At night, red lights are pointed towards the water, bright enough for us to see but not to blind the animals. It was actually quite entertaining to see a hundred people sitting in silence, staring at the lake. But the true entertainment was what was happening beyond the rock wall. An ever changing assortment of animals, including rhinos, elephants, zebras, and giraffes took their turn getting their drinks. 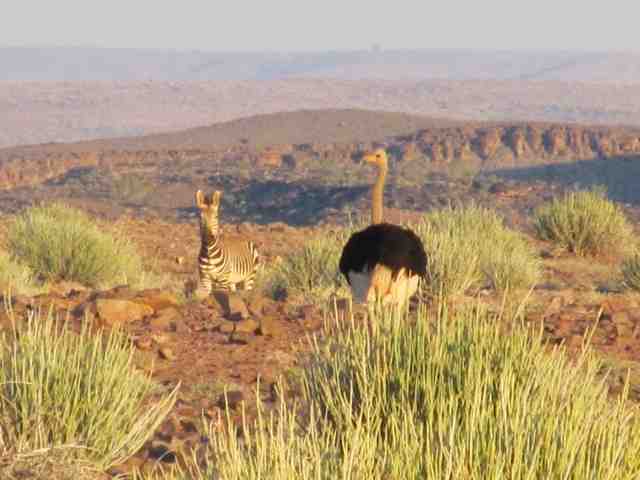 Jackals snuck up behind them at times, and guinea fowl pecked their way around the water. Springbok and wildebeest showed up eventually, and of course everyone waited for the lions, who are much more elusive. It's a little strange, drinking wine out of a camping cup, sitting in a bleacher seat and peering over the rocky edge. For a second it almost looks like people are watching a play. It is most definitely dramatic, and the finest of theaters, nature. I have a friend up in Humboldt county who bought a five acre parcel of forested land in a newer subdivision. He designed and built his own house, and measured carefully, so that his home would be in the exact middle of the property, unlike his neighbors who seemed to put their home up in front with a huge yard behind it. When I asked why, he said because this way he had the most possible space between him and his neighbors in every direction, the most privacy. When I visited, it did, indeed, feel like its own independent environment, quiet and serene, with no disturbance from the sound of cars or lawn mowers or children. Had it not been for the canopy of redwood trees surrounding his home, it would feel isolated. Somehow, for me at least, thick forest makes me feel insulated, not isolated. I keep thinking about his property while driving through Namibia. The entire country seems empty, untrodden, devoid of human life and the inorganic trail of resources and trash that comes with population. We've been a lot of places, with barely visible roads, lots of sand, and heat. It feels like we are in the middle of nowhere, like someone measured carefully to make sure that at any given moment we are as far from anything as possible, meaning we are IN THE MIDDLE of the middle of nowhere. We've spent quite a bit of time driving. Most of the day, actually. Most of the last five or six days. As a group of three guides- 2 Namibian, 1 South African, plus 2 Swiss, 2 Italians, 2 Spanish, 4 German, 1 Dutch, 1 American living in London, and me- we've renamed our overland adventure vehicle. Roy, the given name to this beast, is amazingly equipped for the unpaved roads of Namibia; the African massage. We enter the vehicle from the back, and there are two aisles of airplane style seats (that don't recline) raised above a center gully just big enough for feet. In the front, behind the barrier between the seating area and the driving area- think mac truck- there are seats around a small table and a cooler. It's a hangout place for playing card games and the like. The cooler, of course, is for beer. 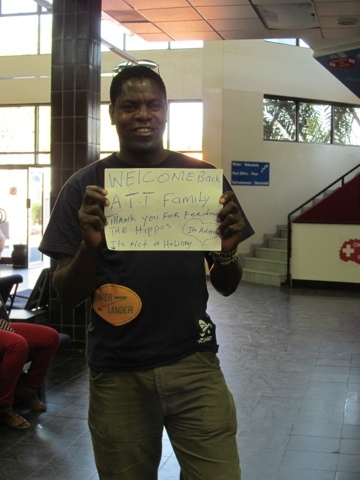 The new name it has adopted is African Tuk Tuk, or ATT. "Tomorrow we have a long day. I don't want to guarantee, but we might see...Expect the unexpected. T.I.A. This is Africa." There are other details of course. But this is what I remember, because this is what is said every night. And now we've created our own rituals. Inevitably at the end of the briefing, our guide Hofti asks if we have any questions. My arm shoots up every night at this point. "What time do we have to get up?" I still don't understand why that's not the first thing. I am in teacher brain, wanting things chronologically. He is in adventure brain- activity first, details second. The answer is usually the same- early. 5 or 6 am. I'm not sure why he tries to sugar coat this or treat it as an aside he can halfheartedly mention as if the early time will disappear, as we all signed up for a camping outdoor adventure and we know these types of things start early. Nobody complains or even makes mention of it. And again the ritual- Mikail says aloud to the group, "don't worry, Rebecca, I will wake you up around 4, to make sure you are ready." Everyone laughs. This is funny because I am always the first person up, aside from our incredible guides. This is also funny because we always wait for the Spanions. The very first day, we were supposed to meet at the office in Cape Town at 7:45 am. They sauntered in at around 10:00. Whether or not they wanted to start this precedent, it now exists. Our guides always ask us to have an African sense of humor and adventure but to keep European time. I think he should edit that to German time on following trips. Our first week blends together in bursts of tent set ups and take downs, desert driving, convenience store stops, and regular pull overs for "pee pee in the bush". The ATT is starting to look like the common area of a college dorm. Towels hang from the storage shelf to the seat, drying or blocking the intense sun. Five liter water bottles line the back of the truck. Pillows, iPods, junk food, earphones,tour books lay strewn across every seat. And shoes. There are shoes everywhere- dusty, sand-filled hikers and flip flops. 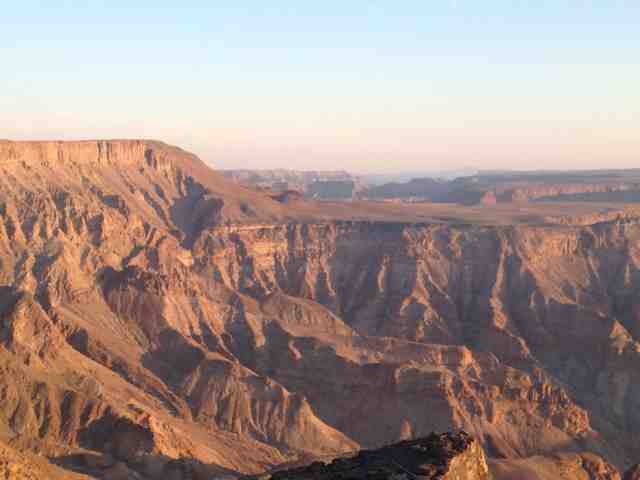 We've stopped a few times, to see the San people, to give some people the option of canoeing in the Orange river, to catch the sunset in beautiful Fish River Canyon. But the highlight of this first portion of the trip is disappointingly named Dune 45. 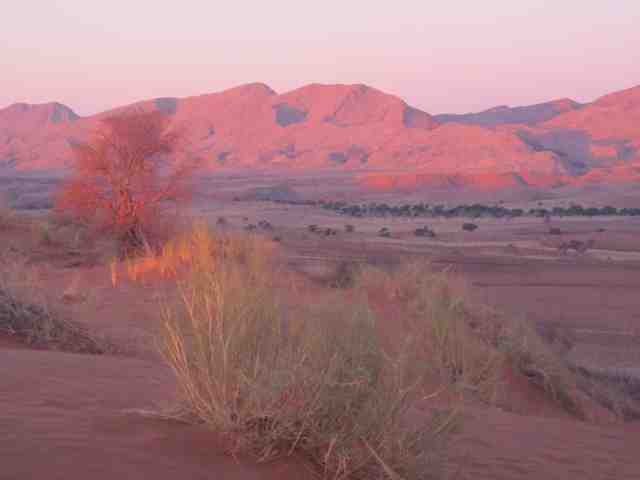 Sossusvlei dunes make up what I believe to be one of the largest areas of sand dunes in the world. This is the second oldest desert in the world, with the highest sand dunes, some reaching 3,000 meters high. The dunes are red due to the iron present and the age in which this iron has turned to rust. 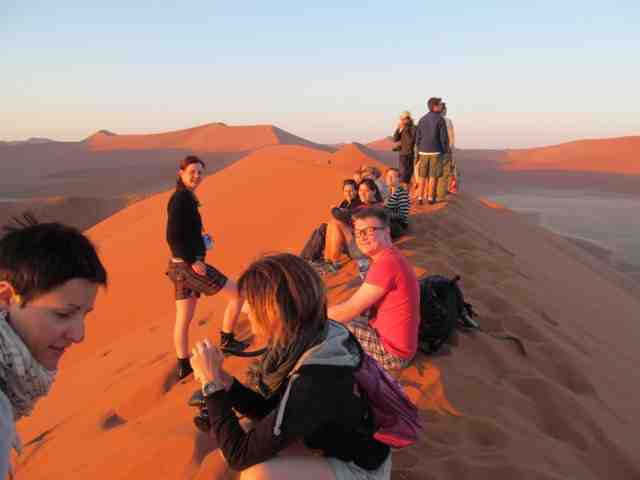 We rise extremely early to climb Dune 45 before sunrise, and are surrounded by people doing the same- the most people in one spot that we have seen since crossing the border into Namibia. The sand is cool and soft, and immediately penetrates everything I have with me. I'm covered in fine rust colored sand, and it's beautiful! The sun rising creates shadows emphasizing the curvature of the dunes, the direction and strength of the wind. 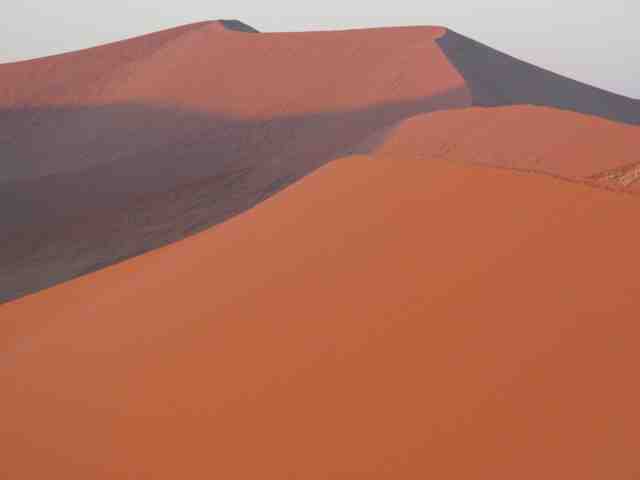 Little ridges are formed on the windward side of the dunes, while the leeward side looks like its never been touched. Gazing across the valley, there are dunes as far as you can see, all shadowed beautifully. All with clearly defined ridges. Climbing is restricted to Dune 45 to decrease impact. Sitting in the sand, letting it run through my fingers, I am amazed that sand so soft can create such sharp ridges. I'm sad when the sun is finally up in the sky and the shadows start to disappear a bit, and that beautiful iron-rich sand starts to get hot. We climb, roll, run, and slide down the dune like children, and there is a beautiful brunch awaiting us in the parking lot. 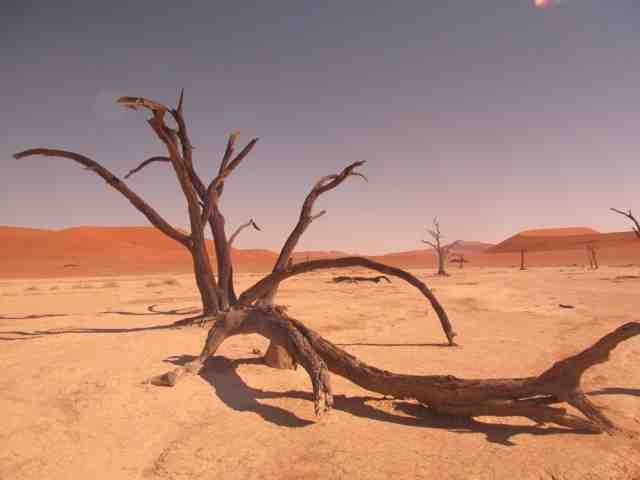 We spent the rest of the day in the area, going to a place called Deadvlei in a 4x4, kind of like a dried up oasis. Eventually on the road, the dunes got smaller and lighter in color, and our African massage came to an end abruptly as we reached the coast to a black tarred highway. The temperature dropped from hot desert temperature to windy cold coast in a matter of moments as we pulled over in Walvis Bay to see the flamingos, hundreds of beautiful flamingos in the lagoon beside the road. Looking around at the manicured lawns, and large seaside homes was strange after where we had been. From here we stopped at the Adventure Center, a warehouse of adrenaline sports at our fingertips. Honestly, it felt like an onslaught of marketing, DVDs of people jumping out of airplanes, going four wheeling in the dunes. For the less adventurous, there was a harbor cruise, and a township tour. Honestly, I was a little put off, and opted instead for some unplanned time with as many showers as I wanted. Stranger still, after a windy lunch at the Adventure Center, we pulled into the German influenced seaside resort town of Swakupmund. It was nice to have access to Internet and real coffee for a few days, and a break from camping. We ate out each night, said goodbye to one of our fellow travelers, and piled back in the ATT after a refreshing weekend.The serene Namibian desert was behind us, but a new adventure was about to begin. I'm rewriting my story. After fleeing a nanny gig, a very kind person took me under his wing, and convinced me to sign up for a tour leaving three days later, from another city, in a different country, even. I don't think about it overnight, or even over dinner. I say yes. 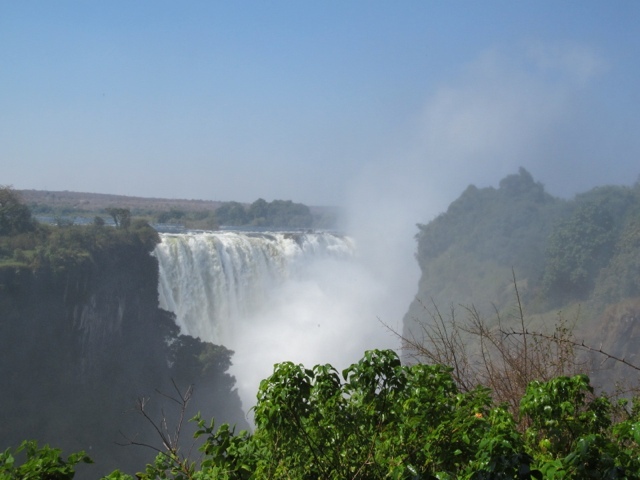 I've just joined a 20 day tour of southern Africa with 12 strangers. In the head space I have been in, I sort of just wanted to be quiet. Soak it in. Let nature heal. Nature is healing. But so is remembering to be the fun loving, quick witted woman I can be. It's making people laugh. It's making me laugh. Except when I'm not. And I've been not. So I am rewriting my story, and it's one I want to be part of. I was on the fence about whether to include my journals from the nanny gig in Swaziland. I am going to include them all (though some are incomplete- it's time to move on), but under just one blog entry. That way, those of you who want to skip reading this part can carry on. So read on or carry on. I took a job as a short term nanny with someone of high academic standards. I believe that children having the opportunity to live and learn in another culture is worth far more in experience than a possibility of being behind in math by a year. You can catch a kid up (whatever that means) in math skills. You can't recreate the patience, flexibility, and new cultural experiences of a host country. Part of my job is to make mom's work easier. 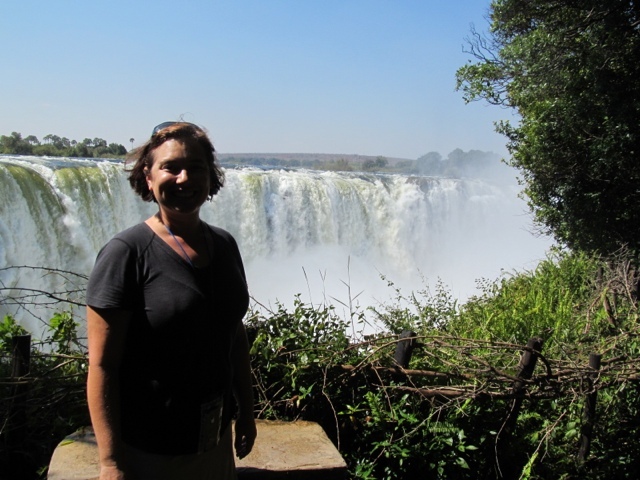 She chose to come without her husband for a Fulbright scholarship, because in our economy at the moment, one can't say, "oh hey, I have an opportunity to accompany my wife and kids to Africa for 12-18 months. Can you hold my job?" It's unfortunate, really. Because I also believe that grown ups bring back incredible skills in adapting, working with people holding different views, and, alas, perspective. Another part of my job is to do lessons with the kids. Both are relatively good students, but in truth, everyone can benefit from some one on one attention, right? I've been teaching for 11 years, working with kids of all ages, races, socio-economic statuses, in both traditional and alternative settings. I have experience (of course, I, too, could always benefit from some one on one attention), with well behaved kids, angry kids, sad kids, hungry kids- in their bellies or in their hearts. But I have never had an experience like this. In the last 48 hours, I've heard more child screams than on the playground of elementary school for the entire semester. I've had doors slammed in my face, been told I was hated and to go away. Once, while the mom was home, as I walked by a room, I noticed the five year old drawing a picture. I told her how nice it was. Her response? She chased after me into my bedroom to stomp on my toes. Not out of the ordinary behavior, but the lack of response was alarming. Mom came after her and lifted her off of me, but no words were exchanged. When I came back into the living room she told me, "she's really sensitive about her art." But no corrective to her daughter that its inappropriate to stomp on people. Not even, "use your words." An hour later, as we sat to dinner, me and the kids, the same child told me to go away, which I ignored. I went to take a bite of my dinner, and she threw food at me. I told her to stop, firmly. Mom came in the room, and I told her what happened. She motioned for me to come outside and said, "maybe you shouldn't be so severe. This is new for them." We spoke a few minutes more, as I felt I had to defend myself after she said maybe it was because I didn't have experience with this age group. I assured her that I had, and this was not ok behavior. The following day, mom asked me to do a lesson with said five year old. Kicking, screaming, yelling insults all ensued. I looked at mom, waiting for an intervention,to which I was met with "I'm sure you've worked with resistant students before" and she walked away. Later, she approached me, asking if I had ever had experience with kindergartners before. I said yes, though not much, but that I had spent a lot of time with many children this age, and literally just came from nannying two boys 4 and 6 for ten hours a day. Again, defending myself. I said this isn't resistance, this is a behavior issue. To this, I was told "this is normal," followed by, "of the sixty kids at her school In kindergarten there are a lot of kids like this." I am wondering who told her this. I am wondering if this is true, how these classrooms are functioning. I am not a parent. I know there are things that come with being an actual parent that change your views on child-rearing, education, behavior management, whatever. But in my many years of successful interaction with students, I have never seen this. I spoke to my friend, a kindergarten teacher with a psychology background, and a single parent of two. One is special needs, and often has her own behavioral idiosyncrasies. I relayed the events of the last two days, not even including the way they treated the maids. I was swallowing anger, surprise, and my pride. I was second guessing myself. Was I over reacting? Was I not being understanding? My friend's response was not only supportive, but included some psychological background; things I'd been thinking but had no words to support. That is a sign of children either having been abused at a young age, or not being given boundaries by their parents. I really don't think abuse is even worthy a thought with this family. But the lack of boundaries is apparent and obviously affecting the kids. Duh. But what to do now? I've been told not to reprimand, basically, and have had very little support in redirecting and correcting their behavior. I refuse to be abused for two months, even by children. After witnessing the lack of boundaries and limits for the first day, I decided my approach would be to start with my own. Our first day alone together, I sat with the boy, and asked him what the rules of the house were. My intent was to find out what moms rules were, what the schools rules were, and then look at the similarities. My intent then was to make sure they had a clear idea what my rules and boundaries were. We couldn't get that far. The only rule was to eat food at the table. Now of course, I know there are others. The child is 8. But the lack of structure was apparent. In fact, later that evening, something happened where he was told to do something. He didn't follow directions, and was told to go do something else or he would get the kindle taken away. He looked at his mom and said, "I don't know what you want me to do. You just said two completely different things." Again, I know we get tired, I know we mis-speak. But this was telling of a bigger picture. I got somewhere with the older child today. We played Monopoly. And he laughed. Mom left with the youngest to do an errand that I desperately wanted to join, but alas, I stayed with the oldest. He started to listen to me and respect me a little. I even got this reluctant writer to write something. It was a simple haiku about the new cat. Tearing him away from books is almost painful, as he probably reads a book a day, and when he isn't reading, he's listening to his kindle while playing video games on his ipad. I'm hoping to use this cat, this poor cat, for writing and art projects this week. The power went out today. It was a beautiful winter storm, the kind you can almost see greening up the trees. It was pretty cold and foggy, so we spent the day inside. I'm still inside 12 hours later. The little one, who's behavior is almost pschitzophrenic, even came over to ask if I would play Monopoly with her. We had fun. She is only five, so every roll of the dice was a great way to practice counting. She did well with the money. The power was out for a while before the mom noticed that the neighbor had light. She wanted to go next door and find out what was going on. The youngest was still wet from her bath, including her hair. She was asked to please stay inside. Rather than stay inside, she started screaming, and running to the front door, grabbing her shoes on the way. I asked her to stop. Her mother, already outside almost to the perimeter gate, yelled for her to go inside. She pushed me aside and went running after mom, so I called moms name. Mom was visibly angry at this defiance, especially in a possibly unsafe situation.The child continued to scream, "NO!" which in three days I have already heard more times than I can count, and she was met with a spanking on the behind, and a carrying of her towards me, but not inside. I was standing on the top of the steps, in the small space between the front gate and the front door. I tried verbally to coax her inside. Se screamed again, and gripped her fingers tightly around the metal bars on the gate. I tried to lift her body off the gate, but her fingers were too tightly attached. She was fighting and not going anywhere, and screaming at the top of her lungs. Her screaming caught again the attention of her mother who directed me to take her inside and lock the door. I went against my better judgement, and tried to force her fingers off the bars. I was finally able to get her inside and the door closed, and she stood in front of me kicking me and yelling at me. I told her she was on time out and needed to go to her room. "NO!!!" she screamed. I tried the counting to 3 that seems to work with all kids. I was just met with another NO and some more kicks. She went for the front door again, and I just grabbed her so she couldn't get out, and her mother came in right afterwards. The child was picked up and taken to the back bedroom, where for the next thirty minutes I heard screaming and yelling from the child, including how much she hated me and wanted me to leave, and more tantrum. No, this was not a tantrum. I am not sure what you call this. I went to the dining room and sat on the chair, trying to force back tears. As a teacher, and 'auntie' to many children in my lifetime, I have seen my share of melt downs and tantrums. This was so incredible, I felt like I was in a dream. She almost made Veruca Salt seem manageable. The insults from a five year old?Not ok, but I can deal with. The kicking and the NO! doesn't compute. Nor does forcefully putting my hand on a child. I wasn't sure what to do with the door incident. But the second I tried to grab that child off the bars, I engaged in the battle. She called my bluff when she kicked me repeatedly once inside the door. And again when she said NO and defiantly didn't go to her room. Had this been my own child, I would have picked her up and put her in her room. But she is not my child. And I am not comfortable doing that. This episode was years in the making. Later on, she continued her rudeness to me at the table. They bought treats today as a bargaining tool for her to be polite. she's a pretty smart five year old, and already told me once, in the middle of telling me she wanted me to leave, that she only did good things to get sweets. She had a cookie after dinner. I stayed up in the dining room writing this, hoping to talk to the mother after she put the kids to bed. I had to first get past the guilt, then the mad, and move into the I statements. I practiced saying to myself, "I am really uncomfortable with what happened with the door today." Not quite right. "I am uncomfortable with the part I played with the door incident tonight." Better. But when mom came out, the first thing out of her mouth was that she was going to bed. She was exhausted. Yes, I would imagine she is. I'm trying to have compassion for both her and the kids. They seem to have dug themselves a big hole here, and I am not convinced, after the two other conversations we have had about the behavior of the children, that mom is convinced that there is a problem. So I guess I will be waking up tomorrow for the fifth time, in hopes that it will be the day that things change. Of course, I know that even if they do, the moments are fleeting. I have to talk with mom tomorrow. I have to tell her I am uncomfortable, and that putting them on time out doesn't work, even after counting and chances, even after positive attention for being polite and asking how they feel when they follow directions, which inevitably they say feels good. I'm at that school in Gretna again, when I walked out after four days of disobedient violent children. I bargained with myself; first that I could do it for the semester. Then, that I could give my two weeks. Finally, I realized the cost was too great for me, personally, to stay. I'm feeling that now. But need to have a strategy and be clear in my communication. And I want never to witness again the intense power of the episode that this child had. Let's see what tomorrow brings. It finally cleared up today so we went on an adventure including horseback riding. We drove to some place near the South African border. The landscape is beautiful, though nothing I haven't seen before. If I had to put my finger on it I would say Montana or Colorado high desert. Green, rocky, hilly, houses good and spread out, golden grasses along the road. Big Sky for sure. We turned off the two lane highway onto the dirt road. We are in a high clearance vehicle, but not 4WD , and we sank in the mud pretty quickly. So far the kids are doing pretty well. I've only heard once how unhappy the youngest one is that I've joined the journey. I hear something about pants, but ignore it. The decision is made to hold off a bit on the horseback riding, as the road is just too unsafe. We venture to a nice little area with small gallery style shops on the side of the road, much like the "Indian Trading Posts" of the American Southwest. The kids and mom run off on their own. I'm happy for the time, and I wonder if she notices how silent I have been. I'm not trying to be, I just am so sad, I am afraid if I say too much I will start crying. I run into them not more than ten minutes later, and they are laden with sugar, the wages for these children. Do this for a cookie, be nice for a candy. Next, we head to the oldest mine in the world, where we have to stop at a gate, and a guide jumps in the back between the booster seats. The older child is still listening to his Kindle. He starts to complain. Again. "Remember, if I hear one more complaint, there will be no more .... " I've forgotten already and wonder how the kids keep it straight. Doesn't matter, though. Whatever it is will still arrive after dinner. Sometimes before. The mine is somewhat interesting, though I must admit I have a difficult time understanding the guide's English. Along with the conversation about how to remedy this situation that has been taking over my head, I am also having a hard time concentrating. They do have some artifacts and a display representing the origin of man, and I remember to remember that I am in Africa, the Mother Land! I take a deep breath and choose to enjoy it. The older child has had enough at this point. He misses his iPad. Oh yeah, that's what that empty threat was- a moratorium on electronic devices. Back into the car we go. We are parked on a hill, and the younger child has to get in the uphill side, so I hold the door so it doesn't close on her face. She gives me the look of death, and tells me to go away and not to touch her door. I tell her that it is going to close on her while she's trying to get into her seat. She glares at me and says she wants to see. I'm tempted. Trust me. "Get in the car, or you can't wear those pants!" Not only a threat that won't be followed through, but one that pretty much can't be. Next we drive to another place that supposedly has horseback riding to inquire about a lesson. Immediately there is fighting and complaining. "Why does SHE have to come?" Who? "Rebecca. It's embarrassing," says the five year old, who's behavior would have embarrassed me if I were her mother. Or teacher. There's a semblance of an answer but no come-to-Jesus conversation. Instead, it's, "Remember? If you want to keep those pants, you have to be polite." FINE! The older child won't get out of the car, so there's another threat about the ipad. It takes twice, and he is beside us now, too. We get information about the horseback riding. It will be another hour or so before they can ride. We tell them we will be back at 1:30. I already know we won't. I have picked up on the follow-through with this family already. I wonder how old I was when I figured out the pace of my own family. Back in the car we go, and it's another battle. This time, as I put my backpack on the floor underneath the smaller child, she stretches her legs out to squish it. I tell her to stop, and she nods her head no at me. Currently, the older child is also not paying attention. He jumps in the car and turns on his kindle, without closing his door, and without buckling his belt. They have a battle of words. "Remember what I told you about complaining? One more time and no more iPad" OK OK! I choose to move my backpack. I am not bargaining cookies or pants or ipads. And after one nice, and two firm directives from me, she still nods her head no, and stomps her feet harder on my backpack. If anyone is wondering, no, mom says nothing. Off we drive to lunch. There's whining in the car, of course, which mom continuously listens to, and engages in. We arrive at a lovely place amidst bougainvillea and stunning views of the rocky peaks, a nice sandy red colored road, and a grass area with swings. There are tons of cats, dogs, and monkeys roaming around. We sit down for lunch and look at the menu. The kids are up and about, and I do my best to ignore them. I am starting to feel like I am kidnapped and looking for some way to send out clues that I need out. In the menu, in large print, there is a popular motto- Unattended Children will get espresso and a free kitten! I snicker to myself because that probably wouldn't phase this mother, even as her children are currently unattended in the gallery. In fact, this is the very place they got their new cat. I also snicker, because I imagine the mother reading it the same way teenagers read the sign "Teenagers, leave home now while you still know everything!" After lunch, the youngest actually asks me to come play with her on the swings. Well, to push her on the swing. I am feeling like a child with a bipolar addictive parent, walking on eggshells. Is this going to end in a hug or a kick?Alas, I am told I am the best pusher ever, and I am almost pleased. Until she tells me not to ever put her blanket on the ground. 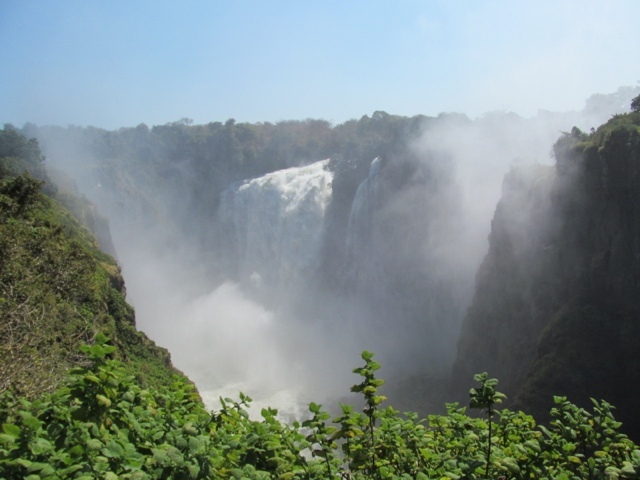 Back in the car again we go, and head to a Swazi cultural village for a 15 minute tour, followed by a 100 m walk to beautiful waterfalls. The drive to the falls is on a dirt road, and the youngest wants to open the windows. She's yelling UNLOCK UNLOCK UNLOCK UNLOCK. OK, yells mom. More complaints come from the oldest, who really doesn't like being outside. And in his defense, he really has been out for a while. Mom reminds him of his promise, or he will have the device moratorium. He has already taken his shoes off, and when he emerges from the car, he still has the kindle in his hand, and he is given another reminder. This time, mom actually reaches out to grab it. I almost exclaim DO IT! But back in the car it goes. The walk is nice, the falls are beautiful, pictures are taken and the youngest says its the best day ever. Until it isn't, because we are back in the car, passing the horseback riding place, and from then on it is 20 minutes of screaming and whining. Some of it is actually ignored, and I am impressed. Once home, the youngest gets engrossed in washing the car with the gardener. Everything is right in the world. Until mom says that she wants them to write postcards to their friends with me while she goes on a run. She tells her angels what needs to happen. They say yes mom. Once mom leaves, and the tv show she promised them is over, I ask them to come to the table. NO. I send them on time out. NO. I try three other ways, but see, I don't have the fake bargaining chip. I don't have the pants or the iPad. The youngest tries to run outside. I tell her to stay inside. She unlocks the door and runs outside. She doesn't obey when I tell her to get back inside, so I step out onto the stoop and watch her. What else am I supposed to do? I don't want to lift her and be kicked again. Mom happens to run by and sees her and freaks out. I say she isn't listening to me. She looks at me surprised, angry even. I almost cry. Struggle ensues. "You have to lock the gate AND the door," she tells me. Mom and child engage in a tantrum. She brings the child inside, and closes the door behind her. She still gets her cookie. And after telling me to make sure the outside gate is locked because its safer, she leaves again and says not to bother with it. The lock that supposedly will keep her daughter safe. Older son is in the back bedroom and I am asked to fetch him for dinner. I am yelled at- don't come in my room. I refuse to listen to you. Get out! So day five isn't a whole lot better than days 1-4, though there was no spanking or major screaming and kicking fit. But I don't know if I would call it progress. I've seen a lot of movies, and read a lot of books about lots of kinds of struggles. I think sometimes it's what makes us all feel a little more normal, and gives us the opportunity to have empathy from our sofas. That's the American way. I have been in one of these movies for the last week. I've been nannying for an american family in southern Africa. I've never had an official live-in nanny gig until this year, but I have had my share of trips and weekends and visits with families for as long as I can remember. I'm a kid person. I'm reminding myself of this right now because I have just fled the scene of being in charge of children. I'm not a parent. I'm a teacher. And I was hired as a nanny, not as an interventionist. But this family needs one of those. Quickly. It's 2002 and I am teaching in Watsonville, ca. My school has just been ranked 6th lowest school in the state. Again. I want to scream. I want to throw away the test scores for a minute and listen to the stories my fourth graders have written during writers workshop. In English. They're superb. Yes, they still mix up b and v, but they're reading and writing and I think they are brilliant. My principal is all administration, no personality. There are rules. And slips. Some are pink and some are blue, and I think there's one for not wearing a uniform, too, but I never remember to hand those out. I kind of avoid the pink and blue ones, too, unless there's an actual fight. But that doesn't happen very often. Every day when the bell rings at 7:15, the children line up in front of their assigned numbers. The vice principal really likes rules, too. He's trying to be creative, but I think he forgets what the big picture is. Every day, he carries a trophy in his hand. He gets on the loudspeaker and announces the class that has the straightest line. My students want this trophy. They all do. Another week has passed and they still haven't gotten it. I assure them in the classroom that they are good at so many things that there is no trophy for. Honesty. Respect. Being kind and polite. Working hard. Doing their best. Sharing. Some days they hear me. Some days, they really want that trophy, the same way some of the teachers have the orange slip out and ready for uniform infraction. A group of us gets together after a staff meeting to discuss the pink slip, blue slip, line trophy dilemma. For us, it doesn't sit right. What are we trying to do here as role models? Teach children not to hit so they don't get a pink slip, not to forget their homework so they don't get a blue slip, stand in a straight line so they get the trophy? We start to meet regularly after school. We may be the only committee that actually does so. We have a name, even. The discipline committee. But behind closed doors we refer to ourselves as the children's liberation party. We discuss the differences between rewards and punishments models, and intrinsic motivation. We read articles and review behavioral psychologists. We do action research projects within our classrooms. We know, intrinsically that rewards and punishments don't work. It takes time, but slowly we work more towards an intrinsic model. There's still a trophy- we can't yet seem to get past a physical reward- but now it's awarded for different positive character traits. we feel like this is a success. Changing the culture of a school is difficult. I'm not sure how to do this for a family that's not my own. My head is back in swaziland and I'm wondering how it got this bad. I am wondering how this family makes it from day to day with all the screaming and whining. She doesn't seem to notice anymore. Get your shoes on and I will give you a cookie. Stop that yelling or you aren't going to get your ice cream. For six days, these are almost the only words I hear from the mom. Bribes. Even after they throw food at me, don't listen to any directions, say mean things. I talk with the mom, but she's living in a world where this is normal. Towards me, the children show no mercy. Doors are slammed in my face, I'm locked out of the house. There is no connection, and I don't know what to do. This has never happened to me before; children who refuse to listen, refuse to follow directions over time. Children who aren't even curious about the other person living in their house, children who have no interest in getting attention from anyone other than their mother. Children who don't even try to build a relationship. It doesn't seem real. It makes me feel heavy and sad. I email grandma, the woman who hired me, for reinforcement. First for suggestions on how to get close to the kids, next for discipline ideas. I don't have the cookies, ice cream, and ipad to use as currency. If I did, i still don't imagine I could bring myself to use them. The woman who was named educator of the year relatively recently, responded back to me saying that I should spank the child. Included in the email are directions on how to do it. This is the precise moment that I know there is no way I can stay in this house for two months. This is a movie, I tell myself. I feel like I have been kidnapped, and I start to plan my escape in my head. I simply cannot take another day of the yelling, the screaming and whining. The children paw at their mother like feral cats who haven't been fed enough. They need attention and parenting, not cookies. But I don't know how or when to tell her that. So I quit. I say I will stay throughout the week if she needs me. They leave for tennis and I get a phone call asking me to leave the following day, and simultaneously an email from grandma saying I should leave immediately. I should have talked to her about it, grandma says. When? While she wasn't sitting at dinner? While she wasn't redirecting her children to behave appropriately? While she went to bed at 6:30 without saying goodnight? I'm in swaziland, in a suburb. Thank goodness for the maids who finish my laundry and call me a taxi. They hug me and tell me I have a good heart, and that the children are difficult. I'm sweating, hoping the taxi driver will come before the family comes home from tennis. I'm throwing things in my backpack, and putting things in a bag to give to the maids. The taxi arrives before the mom and kids return, and my heart is thumping so loudly, I wonder if he can hear it as I get into the car. He has no idea what has happened, and is chatting me up, trying to convince me to go for a drink with him, while I am frantically emailing my family from my cell phone. The entire last few hours have been absurd! Thankfully, I had already connected with someone regarding future travel plans, and he graciously arranges two nights for me at two different lodges. The first night, I hang out on a deck in the beautiful mountains with beer and some interesting volunteers. It's still too soon to take my mind off of it, but these volunteers remind me that there are ways to have empathy without sitting on your sofa, and that there are more worthy causes of my time. They're working with kids in the public schools, and their stories are lovely. There are more important things than worrying about fleeing the scene of two children who have enough adult supervision, just not enough parenting. I am still in Africa, still feel like I'm in a story that is not my own, and desperately waiting for Morgan Freeman's voice to interrupt the ridiculous noise in my head, to tell me what I just haven't learned yet. To tell me how this may shape my future in a way I had never imagined. I hope so, in all good ways. I'm sure there are things I didn't handle well in this situation, and trust me, I've muddled around having the opportunity to speak to the mom. But in the end, I took care of me. Life is too short to stay in a situation that makes you miserable. If this is the only lesson I got out of this experience, then thank you, Morgan Freeman. I hear you, and I will move forward accordingly. After over a year in the idea phase, I'm finally in Bahrain. One of my best friends whom I have known since we competed for first chair clarinet in 5th grade band, has been stationed here with her husband and children. Before I got sick last winter, I toyed with the idea of quitting my job in New Orleans, and coming out here to teach on base, and was then invited to come for the summer and nanny for her kids. Sounded like a good plan, but it wasn't able to come to fruition. It was, however, the impetus for this last six months of adventure. My ten week trip to Central America was the practice run for hemisphere-hopping. It was a success, so I finally planned a trip there. I flew from Bangkok after a month long trip in Southeast Asia with my friend Chris. Culture shock began in the Bangkok airport as thoebes and burkas replaced sarongs. 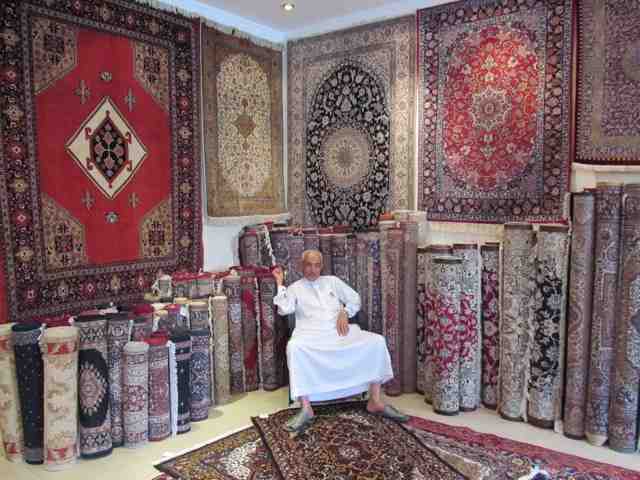 The flight to Dubai was pleasant, as was going through customs at the Dubai airport. The flight from Dubai to Bahrain however, was something else entirely. There were many children on the flight, none of them being parented. Children were climbing on the tops of the airplane seats, had all video games going, were running up and down the aisles. Going through customs was somewhat complicated as they wanted a direct address in Bahrain, which I didn't have. An hour later, I was through, and Jillene was there to pick me up. 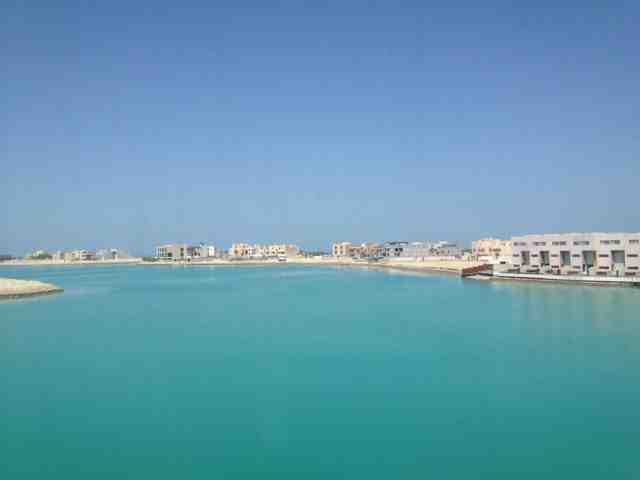 Not far from the airport, Amwaj island is on the northeast coast of Bahrain. It's built on reclaimed land, sand from the gulf. It's a gated community of expats, wealthy Bahrainis, and Saudis with weekend homes (they come to the island over the bridge to drink). Jillene's villa is a spacious two level house with more bathrooms and couches than I could ever imagine using. The backyard overlooks a small swimming pool, which is steps away from the Persian gulf. The color of the gulf is milky blue, and set against the white sand and the white buildings, is absolutely stunning. Yet apart from the beautiful water and the white sand, there's not much else. 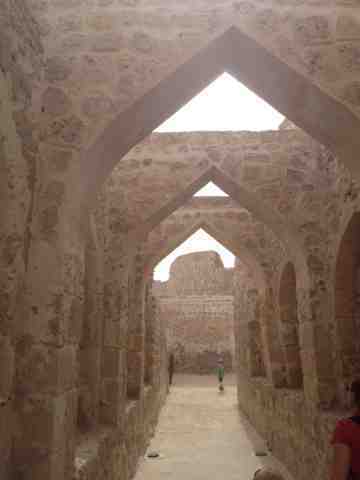 It's so hot, and so dusty, that most activities take place indoors, in elaborate malls. It's no matter, though, as I came more for the company, and getting to know Noah, 6, and Mitchell, 4 was absolutely wonderful. 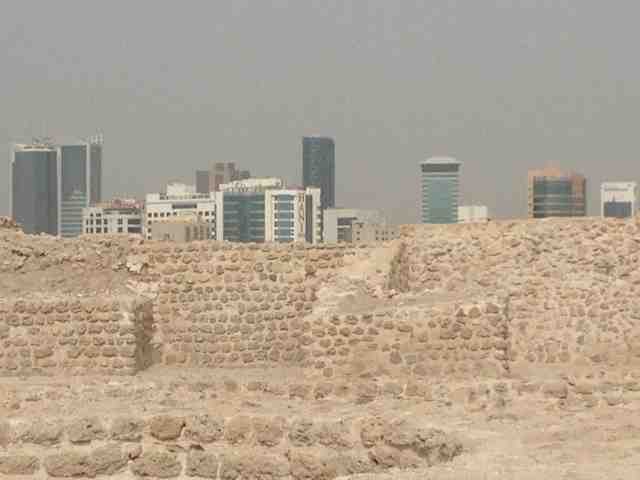 Jillene and Kris refer to Bahrain as the land of not quite right, and it's apparent why. 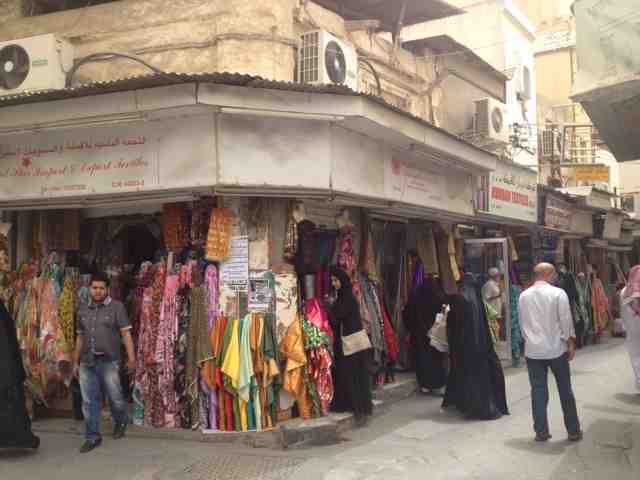 Burka-clad women shopping at Victoria's Secret, devout Saudi Muslims driving like mad to get to the island to drink like fish. And the beautiful homes all have little...quirks, even though most are almost brand new. European dish-drain cabinets located over the stove instead of the sink, open floor plans with loft-style staircases waiting for forehead impact, classes that 'start in April' but haven't. Jillene will be leaving the country in January, so I've lost interest in teaching here. But I'm really glad I was able to come out to visit before they left!